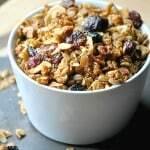 Homemade Granola is a super easy, healthy breakfast or snack that you can make and serve during the week. It is easy to assemble, just combine ingredients and bake. 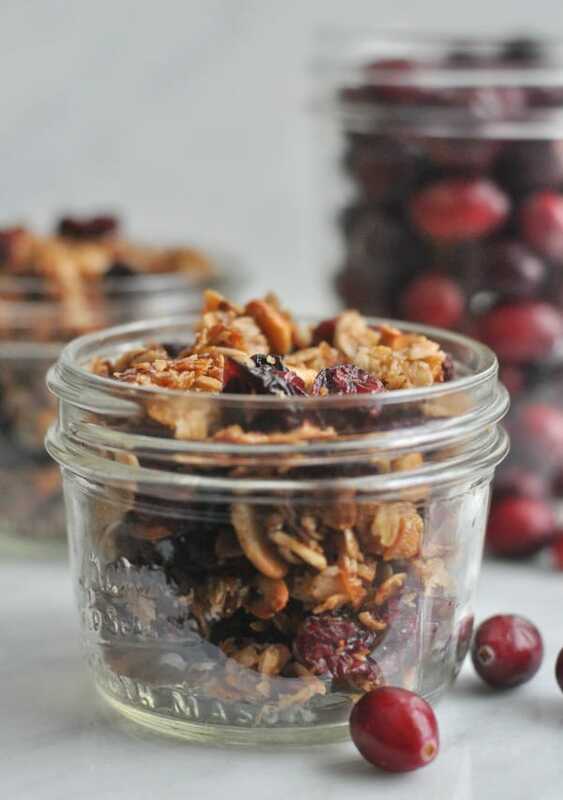 In this Cranberry Granola recipe, I use yummy winter spices and dried cranberries that make it perfect for cold weather months. 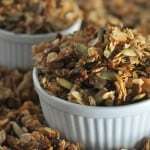 Homemade granola is also a really versatile food in that you can easily substitute your favorite spices and dried fruits. In the fall, I like to my Pumpkin Spice Granola. When I need a chocolate fix, I make my Cherry Chocolate Granola and if I just want regular good old fashioned granola, I make my Homemade Granola. 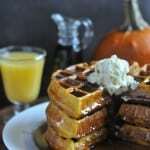 What makes this version special is that I use a combination of Cinnamon and All Spice spices. The All Spice gives the flavors of cloves and nutmeg. 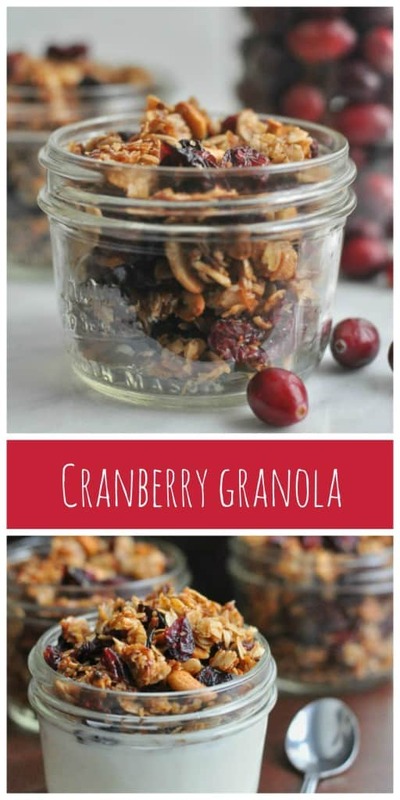 This gives the granola a great seasonal flavor that perfectly combines with the cranberries for a winter granola. 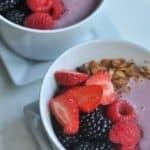 So it’s perfect for a lighter breakfast served on yogurt or snack that always seems fitting at the beginning of the year (I tried on my snow pants today and they were TIGHT) but it’s also perfect for a gift. This year for the holidays I packaged up “Naughty and Nice” packages for my neighbors with packages that contained Cranberry Granola in the “Nice” bag and my Peanut Butter Surprise Cookies in the “Naughty” bag. Make this recipe in a jelly roll pan lined with reusable parchment paper and if making in a different pan, closely watch the granola so it doesn’t burn. 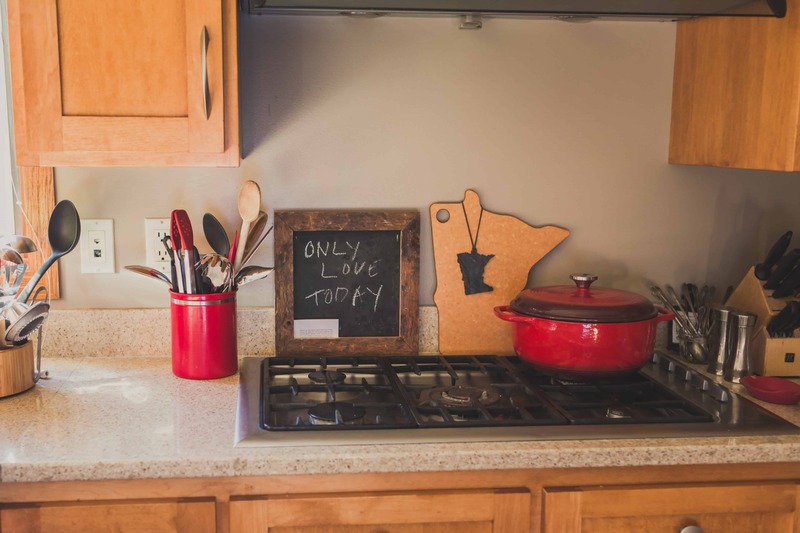 Also, oven temps vary so keep an eye on your granola when it goes in for the second batch of baking. Pull it out when it reaches your desired level of browning. Leaving it in for too long can burn it so I try and make this recipe when I have plenty of time to keep an eye on it. I have also found different types of shredded coconut has a higher burn temp so again, watch it closely at the end. In a large bowl, combine oats, coconut, oil, honey, nuts, and spices. Spread in a jelly roll pan lined with parchment paper and bake on a middle rack for 20 minutes, stir and return to the oven for another 5-8 minutes until golden brown (keep an eye on it, in case your oven cooks hot, decrease the time). 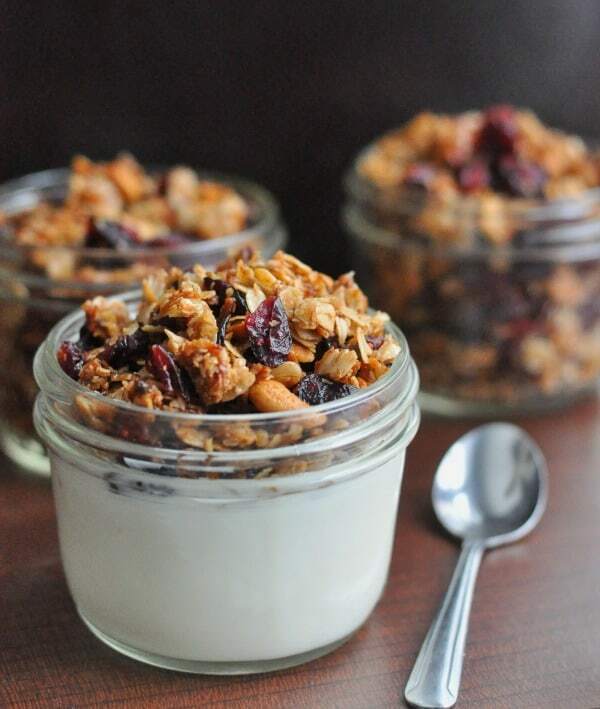 Allow the granola to cool and then add dried fruit. This entry was posted in Breakfast and tagged breakfast, easy, food gift, fruit, gift, granola, healthy, new year, nuts by Alice Seuffert. Bookmark the permalink. 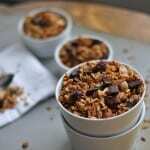 Just finished making a half batch of the granola but will make more next time – it’s great! 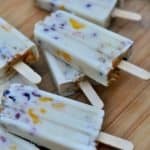 Thanks so much for trying the recipe and coming back to leave feedback! I really appreciate and am so happy you enjoyed it! It is a family favorite for us!